Clip art is predrawn generic artwork, and Microsoft provides many clip art files for free with its Office products. 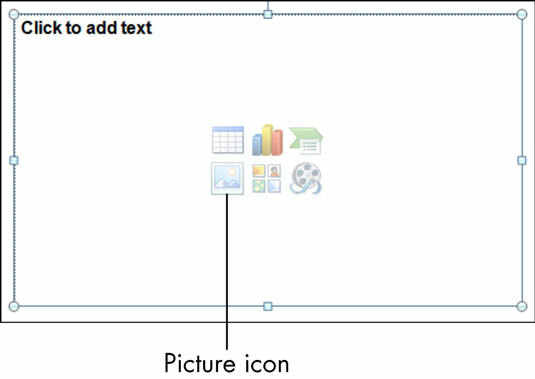 You can insert clip art into your PowerPoint slide layout. Display a slide that contains a Clip Art icon on one of its placeholders. If the current layout doesn’t contain a Clip Art icon as a placeholder, switch to a different layout or delete the existing content from the Content placeholder so that the Clip Art icon is available in it. Click the Clip Art icon to open the Clip Art task pane. In the Search For box, type a word that describes the artwork you want; then click the Go button. Samples of the available clips appear. If your Internet connection is active, PowerPoint also includes clips from the Internet in the search results. Click the clip you want. It’s inserted in the placeholder. (Optional) Move or resize the image as desired. To move the image, drag it by its center. To resize the image, drag a selection handle around the edge. You can also insert clip art as independent objects on slides, separate from the layout placeholders. To do so, do not select a placeholder on the slide. 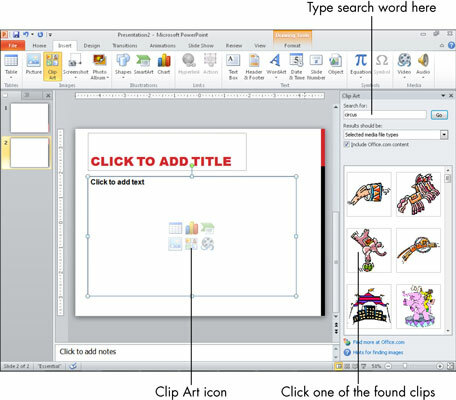 Instead, just display the slide and then choose Insert→Clip Art to open the Clip Art task pane and go from there.